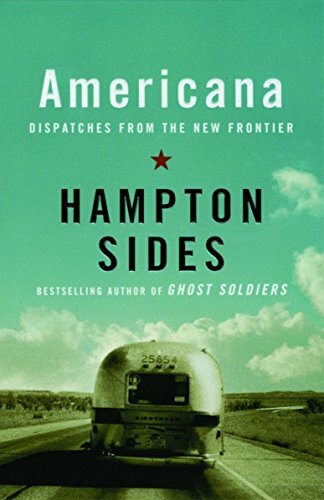 Hampton Sides is probably the author that's gotten me really interested in History, one of my current majors in college. In 2001, he published a book called Ghost Soldiers, which was about a US Army Ranger mission that rescued nearly 400 prisoners from the Japanese Army in the Philippians. The book was outstanding and very well written. Since then, I've kept my eyes out for any further publications by Hampton Sides, and just last year, a new book by him was published. To my surprise, it wasn't another history non-fiction work, but an anthology of various essays that he wrote, brought together into one volume, entitled Americana: Dispatches from the new Frontier. A couple weeks ago, I finally remembered to order the book through the library's interlibrary loan system, and jumped right into it. The book is just as good as Ghost Soldiers, but very different. I had been surprised to learn that Sides was a magazine editor, which explained the number of various essays. The book was described as a "Sparkling mosaic of our country today, in all it's wild and poignant charm." That's certainly accurate. The only other book that I can think of is Travels with Charley, by John Steinbeck as he traveled across America to re-introduce himself to a country that he had forgotten. Americana is a very scattered book, consisting of thirty essays, divided into various sections: American Originals, about some of the countries more interesting people, American Edens, about various locations, American Rides, transportation, American by Birth, Southern by the Grace of... about southern lifestyle, Americans Abroad, about various people overseas and locations, American Obsessions, pretty much self explanatory, and America, Post 9/11, regarding the current war. My first reaction to this entire book was one of amazement and jealousy. I'm very envious of Sides for the traveling that he's done all over the country and the places and events that he's seen. It's quite something. If there's one thing that this book isn't, it's patriotic. It doesn't go out to glorify any part of our country, nor gloss over details. In a sentence, this is us. We're strange, weird and messed up, but deeply interesting and diverse. We have interesting relationships with each other and the world, and we know it. Some of these essays cover some of the more interesting events that I've seen, such as the New Age hippies: Zippies, G. Gordon Liddy and his private security firm, Tony Hawk, the skateboarder, Bass Fishing, Flooding the Grand Canyon, Harley Bikers, Racing in the Sahara and spelling bees. The sheer number of different stories in this book are incredible to read, and it really opens your eyes to the size and scope of the nation, with all of it's humor, ridiculousness and fun. The book has it's darker moments, particularly in the last section, covering the post 9/11 events. I think that the hardest one to get through was 'Points of Impact', which follows three survivors of the World Trade Center disaster, One on the 88th Floor where the plane hit, one at the lobby, who saved a woman and a Port Authority officer trapped in the rubble. It was fairly intense, and eye opening, particularly for someone like myself, who's avoided some of the stories. 'The Ghosts of Baatan', which seems to be related to his book Ghost Soldiers is a somber look at our history. Also fairly hard was the essay 'First' about Shane Childer, the first US death in the Second Iraq War. But all of these stories take a fairly critical look at ourselves, and I have gotten the impression from almost everything that I read nowadays, that people don't know the country. We're a nation who's people don't know much about ourselves, who identify themselves as American without knowing what that means. This book is a good step in national personality, and for every one essay in here, there are thousands of others waiting to be told. The only other book like it is Steinbeck's, who traveled the country to reeducate himself about the country, avoiding the glamour and sparkle of the tourist traps and getting to know the flow and current of what makes us tick. The same question is asked in both books, directly or indirectly: What makes us American?I say that it's the diversity, size and sheer number of different people sharing a home here. I think that both books would agree to that.